All eyes were on Hurricane Florence Wednesday as the Category 3 storm barreled toward the U.S. East Coast. 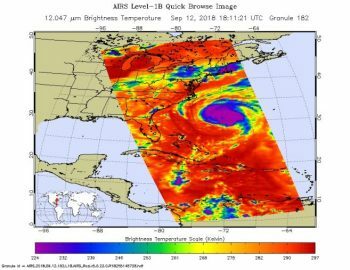 NASA’s Atmospheric Infrared Sounder (AIRS) instrument was watching, too, and captured new imagery of the storm’s approach. AIRS, in conjunction with the Advanced Microwave Sounding Unit (AMSU), senses emitted infrared and microwave radiation from Earth to provide a three-dimensional look at weather and climate. It acquired infrared and visible light images at 1:30 p.m. EDT Wednesday. In the infrared image, a symmetrical ring of deep, cold rain clouds is shown in purple. Warmer areas, including a well-defined eye, are shown in blue. Shallower rain clouds are shown in green, while the red areas represent mostly cloud-free air moving away from the storm. The visible light image shows Florence much as our eyes would see it. It showcases the storm’s thick cloud shield with clouds that extend far from the eye of the storm. Hurricane Florence underwent rapid intensification from a Category 2 storm to a Category 4 storm earlier this week. Although it was downgraded to Category 3 on Wednesday, the storm remains large and powerful with the potential for devastating winds, rain and storm surges. States of emergency have already been declared in several states along the coast. Launched into orbit in 2002, the AIRS and AMSU instruments fly onboard NASA’s Aqua spacecraft and are managed by NASA’s Jet Propulsion Laboratory in Pasadena, California, under contract to NASA. JPL is a division of the Caltech in Pasadena.